It consequently qualifies as Vulnerable. 2010. Spheniscus humboldti. In: IUCN 2010. IUCN Red List of Threatened Species. Version 2010.3. <www.iucnredlist.org>. one broad band across their crests, not two. It is a seldom guest at winter in Tierra del Fuego, coming down from the western coast of South America. which is itself named after Alexander von Humboldt, an explorer. 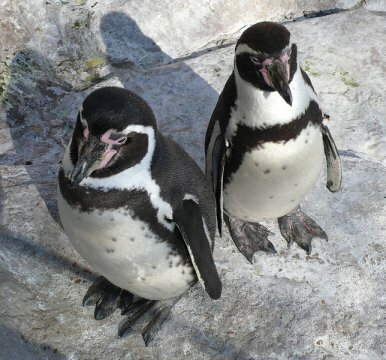 Humboldt Penguins are medium-sized penguins, growing to 65-70 cm (26-28 in) long and a weight of 3.6-5.9 kg (8-13 lbs). down the flanks to the thigh. They have a fleshy-pink base to the bill. 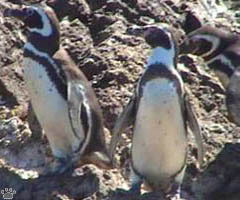 Juveniles have dark heads and no breast-band. They have spines on their tongue which they use to hold their prey. 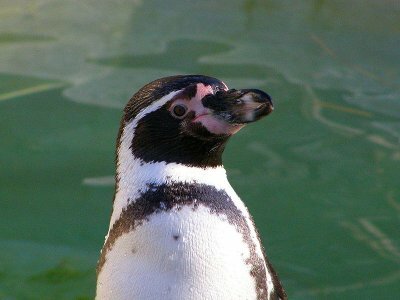 that of the Magellanic Penguin on the central Chilean coast. 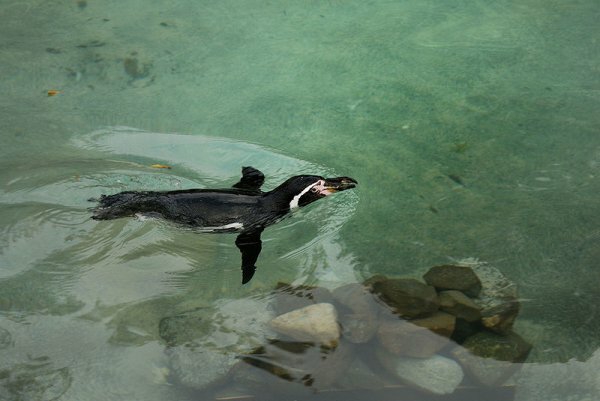 Humboldt Penguin swimming on the surface of water at Dublin Zoo. estimated at between 3,300 and 12,000.